Anybody passing through Sperryville, Virginia can’t help but be drawn to the creative hand-painted “Trout Addiction” sign. 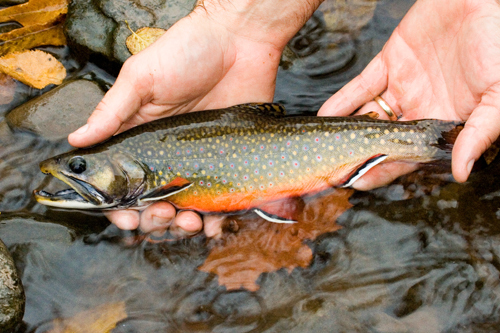 “Come Get Hooked, Guided Fishing Tours, Handicapped Welcome,” topped off with a spectacular brook trout everybody’s raving about. Kind of makes you want to go fishing. “It’s nothing fancy, it’s not even trying to be fancy,” insists Eddy Burke, the down-to-earth fishing guide whose home is behind the sign. “I want to be able to take kids and the elderly — maybe some wounded veterans — and have them catch trout. Fishing guide Eddy Burke heads down the bank to a favorite fishing hole where the Robinson and Rose Rivers meet near Syria, Virginia. Born and raised in Rappahannock County, his ancestors displaced by the creation of Shenandoah National Park, the 58-year-old Burke, a master plumber by trade, and his wife, Lisa, who commuted to Alexandria for her job, always talked about guiding fishing tours from their Main Street home. Which means when he set out for Madison County one morning this week the back of his SUV was filled not only with fishing gear — casting and fly rods — but a picnic basket containing the most delectable smoked (by Burke himself) salmon this side of Kodiak. And then there are the trout that can be consumed almost as quickly as they are caught. As the weather warms, Burke looks forward to guiding locally this year on the Hughes, Robinson and Rose Rivers in Madison County, as well as the limestone streams surrounding Luray. “Limestone only runs a certain streak,” he educates. “There’s no limestone on this side of the mountains, it’s on the other side. You can’t beat limestone; it’s premiere. That’s why there are springs over there in Luray you can sit a house in — millions of gallons of water flowing in and then dumping into the Hawksbill. There are rainbow [trout] in there by the hundreds. The Robinson River in Madison County is one of several local rivers and streams stocked by with trout. For the more adventurous, Burke knows every trout-filled mountain lake from here to the southwestern corner of the state. “If somebody wants to experience a true wilderness trip it can happen,” he says. “The high mountain lakes are incredible. I prefer them. That’s the cream of the crop. A trout stream is harder to fish if you’re not an experienced fisherman, but the lakes I can take the kids to . . .
“If you don’t spend a least a day or two and camp overnight it’s not worth a trip in there,” the guide adds. “Some lakes you have to hike four or five miles into, but it’s worth it. There’s no bells or whistles to bother you. You can camp, you can build your little fire, you can cook, the kids can play, the dogs can run, it’s just wide open. Book a “Trout Addiction” guided fishing tour by phoning 540-987-9129.